This article has been updated, please scroll down for updates. RIM’s Inside BlackBerry blog has been hacked after the company declared it would cooperate with UK Police to help bring individuals involved in the London riots to justice. We feel for those impacted by this weekend’s riots in London. We have engaged with the authorities to assist in any way we can. As in all markets around the world Where BlackBerry is available, we cooperate with local telecommunications operators, law enforcement and regulatory officials. Similar to other technology providers in the UK we comply with The Regulation of Investigatory Powers Act and co-operate fully with the Home Office and UK police forces. 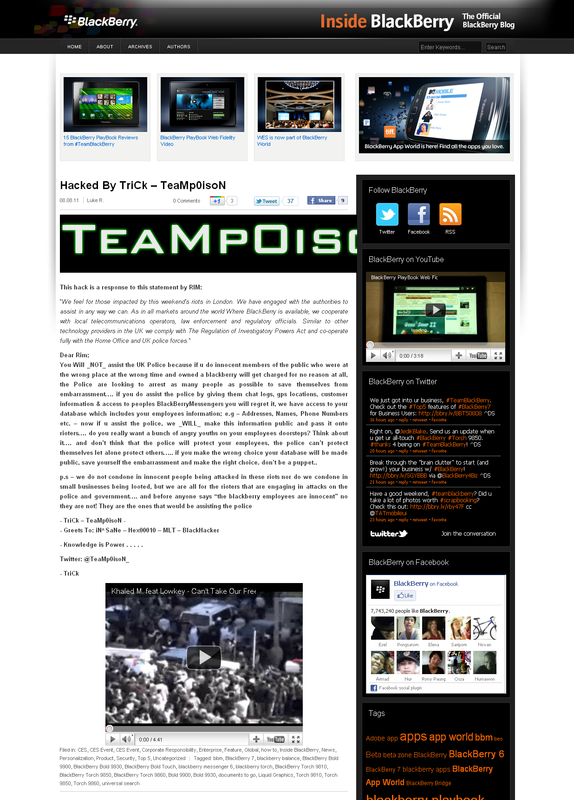 A hacking group going by the name TeaMp0isoN takes credit for the attack, issuing its own statement that says that innocent members of the public will “be charged for no reason at all, [as] the Police are looking to arrest as many people as possible to save themselves from embarrassment”. 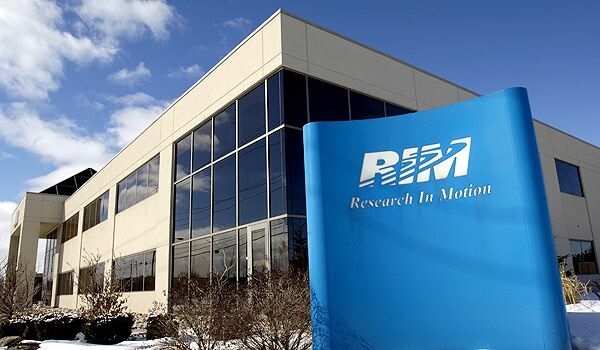 The statement makes references to privacy concerns, warns of rioting at RIM’s UK offices and states that its databases could be made public if they do not “make the right choice”. p.s – we do not condone in innocent people being attacked in these riots nor do we condone in small businesses being looted, but we are all for the rioters that are engaging in attacks on the police and government…. and before anyone says “the blackberry employees are innocent” no they are not! They are the ones that would be assisting the police. As the riots became more widespread, reports suggested that rioters and looters were using social services including Twitter, Facebook and BlackBerry Messenger (BBM) to coordinate their attacks. Misinformation spread on Twitter after it was falsely reported that RIM would be disabling its BBM service in the twilight hours to reduce opportunities for rioters to plan their attacks. The Guardian reported yesterday that Steve Kavanagh, the deputy assistant commissioner of the Metropolitan police, said that “really inflamatory, inaccurate” messages on Twitter were mainly to blame for the disorder. He added that “social media and other methods have been used to organise these levels of greed and criminality,” confirming that the people behind the messages would be arrested. RIM has worked quickly to remove the offending blog post, but we have embedded the page below for you to view. Click the image to view it at full size. Thanks to @jhfisher for the image. Update: It appears RIM’s BlackBerry blog has been taken offline, with browser requests failing to retrieve any content from the site.